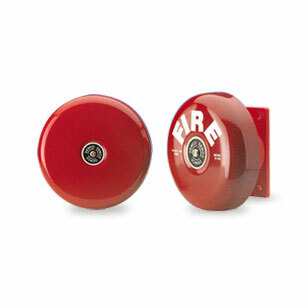 The Call Point is surface mountable and has an easily resettable element rather than a break glass. It also features a unique �Plug and Play� installation concept designed specifically to reduce installation time. The call point utilises a terminal block, where all installation cabling is terminated. Its address is set at the commissioning stage by means of a seven-segment DIL switch. 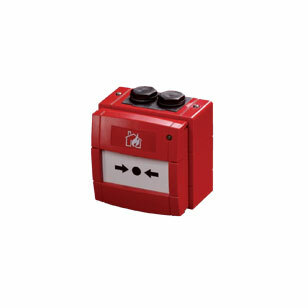 A single bi-coloured alarm LED is provided which is controlled independently of the call point by the control panel. The LED is illuminated red when the call point has been activated and amber/yellow to indicate a short circuit. Once activated, the Call Point can be reset by inserting the test key into the bottom of the unit until the key clicks into position, next remove the test key and push the front cover up until it clicks home. The unit operates at 17-28V DC with protocol voltage pulses of 5-9V. No electrical supply greater than 50V AC rms or 75V DC should be connected to any terminal. Designed for indoor use only it includes four LEDs, two red and two yellow, which are visible through the front cover of the enclosure. One red LED is illuminated to indicate that the relay is set. The second red LED is illuminated to indicate that the switch input is closed. One yellow LED is illuminated whenever a fault condition (open or short circuit) has been detected. The other LED is illuminated whenever the built-in isolator has sensed a short-circuit loop fault. The enclosure is moulded from white self-extinguishing polycarbonate.